On a similar note to my last post I see that funding for the Children and Family Court Advisory and Support Service ('CAFCASS') has been frozen for the second year running, which effectively means that their budget has been cut in real terms. It amuses me how this sits with section 11(1) (a) of the Children Act, which states that in any application relating to children the court should "draw up a timetable with a view to determining the question without delay". As any child law practitioner will know, the biggest time factor in most such applications is how long it will take the CAFCASS officer to prepare their report. Indeed, often the court will carefully work out a timetable only to be subsequently told by the CAFCASS officer that they can't prepare their report by the date fixed by the court, due to workload and/or lack of staff. Now such problems are only going to get worse. Another case of a government setting a target (to show the electorate how marvellous they are) but failing to provide proper funding to ensure that that target can be met, thereby passing the blame (in the eyes of the public) to the people who are struggling to do the actual job. To use a motto of this government: "every child matters, but not if it costs too much". Tax credits are often an important factor in family finances after relationship breakdown. However, the system is horrendously complicated and it is extremely difficult to find out how much a claimant will be entitled to. Now I read that the Commons Public Accounts Committee estimates that in 2004-05 H M Revenue & Customs overpaid claimants by a mere £2.2bn for the second year running. The hardship that this is going to cause to families that have to find the money for repayments can only be guessed at. Surely, it is not beyond the wit of Government to come up with a system that is simple, fair and workable? The arguments raised in the Miller decision (see my previous posts here and here) continue to be discussed in the non-legal media. In an article in the Times Online today it is suggested that blame for marriage breakdown should be brought back and that since marriage is a contract "blame can usually best be expressed contractually, ie, financially". Of course, this is not entirely accurate as we still have a fault-based divorce system where adulterers and those 'guilty' of unreasonable behaviour are regularly penalised by being ordered to pay the other party's costs of the divorce. Still, that is usually only a few hundred pounds - what about the financial/property settlement? Why should the 'guilty' party still get 50%? It is easy to see the popularity of such arguments, but surely this will lead to far more contested divorces and contested divorce settlements - is that what we want? My hope is that when they give their decision in the Miller case the House of Lords will make it quite clear that conduct will continue to be relevant only in exceptional cases. Reading my copy of Family Law each month can be pretty hard going, so I look forward to the light relief provided by The Last Word column by Gwynn Davis. The Last Word can take various formats, but often comprises a frighteningly realistic dialogue between the Minister for Constitutional Affairs and Crispin Smooth, senior policy advisor. In this month's column, for example, we have the two of them discussing government plans to create a family court. At one point the subject of court fee increases comes up: "What happened to access to justice?" asks Smooth, "We're still quite keen on that" replies the Minister. Brilliant stuff, but the best quote comes from the Minister when legal aid is mentioned: "Only the dementedly public spirited enter into a contract with the LSC these days". Quite. Mention of Carlill vs Carbolic Smoke Ball Co. brings back bad memories of studying contract law at University. Notwithstanding this, I have acceded to a request to mention a commercial website on this blog: Carbolic Smoke Ball Co. , where you can find 'unusual products for the professions', including lawyers, accountants, doctors and dentists. I particularly liked the pen holder made out of a real pet coffin with a plaque which reads "Ashes of Difficult Clients" and the mug with the inscription "I can only please one client per day - today is not your day". Who needs client care? Just make sure that any clients seeing such items have a good sense of humour! I see fathers' rights campaigners have put themselves back in the news today. This time two members of the group called 'The Real Fathers for Justice' have scaled Westminster Abbey with a dummy on a cross using the slogan: “Crucified By The State, Ignored By The Church”. The group have a very professional-looking Flash website, on which there is a press release relating to todays protest. With all such protests, one wonders what it says about the men concerned as parents - as a spokesman for the Dean and Chapter of Westminster Abbey said: "we would be happy to listen to views presented in a calm and rational way". As reported in the Guardian Unlimited today the CSA has released figures showing that 70% of absent parents pay at least some child support, a much higher figure than previously thought. Interestingly, a slightly higher proportion of mothers than fathers failed to pay anything. Worryingly, however, the Agency also disclosed that the average time it takes a parent with care to receive any maintenance has increased to nearly eight months. One can only imagine the hardship that this is causing for those parents and, in turn, the children. + More staff - clearly, the agency is chronically under staffed. My worry here is that a huge new investment in staff is required, but is unlikely to be forthcoming. + Cases need dealing with quickly and properly - obviously, but this can only be achieved with more staff. + Let the court deal with complex cases - agreed, but how do you define 'complex'? + Extend the range of enforcement measures and use them - agreed. + An independent arbitrator to exercise discretion - the current system is too rigid, and produces results that are often unfair in the particular circumstances of the case. The problem, of course, is deciding in which cases to allow discretion. + Allow couples to sort things out themselves - this is, of course, built into the present system, except where the parent with care is on benefit. Enough of the frivolity. On Sunday the Independent Online reported that "wealthy professional women are increasingly using private detectives to check out their would-be husbands before they marry, fearful of the financial consequences of divorce". Apparently this is a practice that originated in the USA but has now spread to this country, spurred on by the recent trend for more generous divorce settlements which, it is reported, "have encouraged some people to deliberately provoke divorce proceedings". The article quotes a private investigator who says that his firm are taking on such cases at the rate of one every week or so and that, rather disturbingly, "90 per cent of men we check out are found to be wanting". I know that as a divorce lawyer I have a vested interest, and perhaps I am old-fashioned, but I still find it sad that so many people seem to be motivated by money rather than the emotional aspects of a relationship, and I am not just referring to the women here. 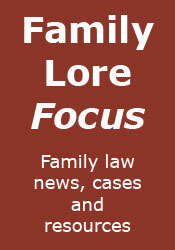 On Saturday all subscribers to Family Law Week received an April fools email advising of "EU divorce harmonisation", including such changes as all family proceedings having to be conducted in both English and French and the "yardstick of equality" being replaced with the "metre of matrimonial equivalence". Needless to say, your writer was not fooled for a minute (59 seconds maybe, but definitely not a minute). A quality service for all! In a shock move today the Legal Services Commission announced the abolition of legal aid contracts for law firms, legal aid forms and legal aid pay rates. In future, any firm wishing to do legal aid work will be able to do so on the same basis as private work, charging at market rates. A spokesman for the Commission said: "We want the poorest in society to receive the same service as the richest. Now they will be able to see any solicitor at any time, will not have their matter passed to the lowest paid and least qualified fee earner in the office, and the solicitor will be able to get straight on with the work without having to complete fifty pages of forms". Reacting to the news, The Law Society said: "This is a great day. For the first time legal aid clients will get the same level of service as private clients, and solicitors will actually be able to do legal aid work for a profit. Yes, this is certainly a date to remember".